More information on each center and clinic is listed below. Click on the link in each section below for center and clinic contact information. The Autism Center at Misericordia University is designed to act as an informational resource for clinicians/practitioners and caregivers, as well as, provider for specialized services. Use the link above to access resource and contact information on Misericordia University services for autistic individuals, special camps, other community resources, current best practices, and material designed to assist professionals and family members. As a part of Misericordia University's Autism Center, Autism for Lifelong Learning (ALL) is designed to provide supported employment, competitive employment, and community participation support services to adults with autism. For more information about the Autism Center at Misericordia University, please call (570) 674-6400 or email the center at autism@misericordia.edu. 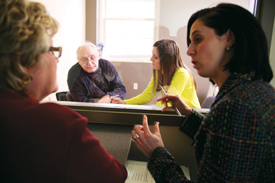 The Speech-Language and Hearing Center at Misericordia University is a comprehensive facility serving the residents of Northeastern Pennsylvania. Located on the second floor in John J. Passan Hall, the center provides complete diagnostic and speech, language, and hearing services for children, adolescents, adults and elderly with communication disorders. The Physical Therapy faculty have partnered with NovaCare to provide physical therapy services to the community and educational opportunities for Misericordia Physical Therapy students. For further information, please send an email with details about your physical therapy needs to ptclinic@misericordia.edu. The pediatric clinic, coordinated by physical therapy faculty, see infants and children of all ages from the community throughout the year. As part of service learning coursework, students in the physical therapy program obtain hands-on experience while assisting in the treatment of these patients. Students are under the direct supervision and constant guidance of a professor, licensed therapist throughout the treatments. The clinic is provided at no cost and health insurance is not required/involved. For more information, please contact Maureen Rinehimer at mrinehimer@misericordia.edu or (570) 674-6759. The Assistive Technology Research Institute (ATRI) at Misericordia University is a regional resource to provide information and education in the application of assistive technology and universal design principles to allow individuals with limited function to participate in their personal lives and their communities to the greatest extent possible. For more information, please contact Denis Anson at danson@misericordia.edu or (570) 674-6413. The falls prevention program is open to people 65 years or older who are living within the community. The program is free and consists of 12 sessions on select Fridays beginning in January for adults age 65 and older at The Hope Center, 205 Main St., Luzerne. The program kicks off Friday, Jan. 18, 2019. To register for the program, please contact Kathleen Hughes-Butcher, M.S., O.T.R./L., academic fieldwork coordinator, at (570) 674-8180 or Dana Kinter, M.S., O.T.R./L., adjunct faculty, at (570) 262-0253. For additional information, please log on to the clinics and centers menu at www.misericordia.edu/chse. Sessions will be held Jan. 18 and 25; Feb. 1, 8, 15 and 22; March 1, 15, 22 and 29, and April 12 and 26. Snow make-up session will take place on May 3 as needed. Each session runs from 9:30-11:30 a.m. The Center for Faculty Professional Development (CFPD) is an organization, facility, and community for supporting excellence in teaching across disciplines and across campus. CFPD organizes workshops on topics ranging from teaching strategies to new academic technologies. Additionally, CFPD offers opportunities for faculty to attend webinars as a group and share ideas that grow out of these meetings. Learn more about CFPD. The Center for Human Dignity in Bioethics, Medicine, and Health fosters deepened understanding of medical practices and their ethical ramifications. The Center promulgates knowledge about past practices (particularly during the Holocaust, but also focused on domestic and international practices of previous eras), current practices, and future medical endeavors. 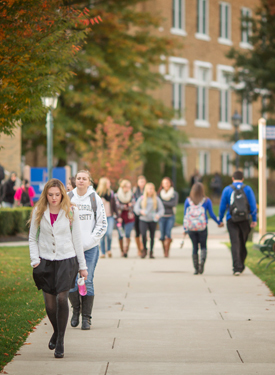 The Center serves as a natural extension of Misericordia University’s mission and its expertise in both the humanities and the health sciences. Visit this link to learn more about the center.